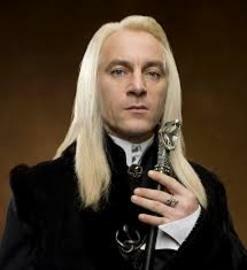 Lucius Malfoy is a senior Death Eater and patriarch of a pure-blood Wizarding family; he lives with his wife Narcissa Malfoy (née Black) and their son Draco at the Malfoy Manor in Wiltshire. Lucius is a school governor of Hogwarts before he is sacked, and has very close connections at the Ministry of Magic. To maintain his reputation and influence, he makes donations to the Ministry, to charity, and to St Mungo's Hospital. He was educated at Hogwarts, where he was a prefect in Slytherin House.